a little girl wanted to have a fairy birthday party. 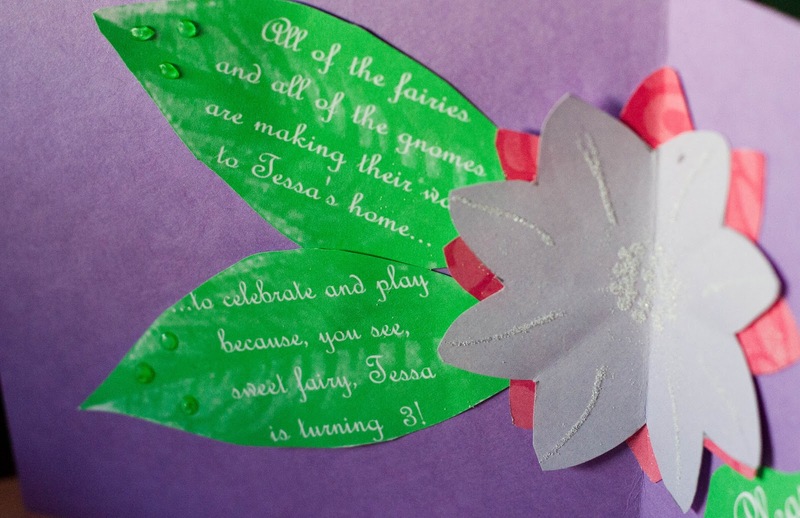 So her mother sent invitations to all of the little fairies and gnomes in the land, asking them to come and celebrate with her. And her mom–the Fairy Queen–worked and worked and worked until all of the fairies and gnomes arrived at her house so that they could have a woodland adventure. (And then she kept working after they arrived, too. 🙂 ). 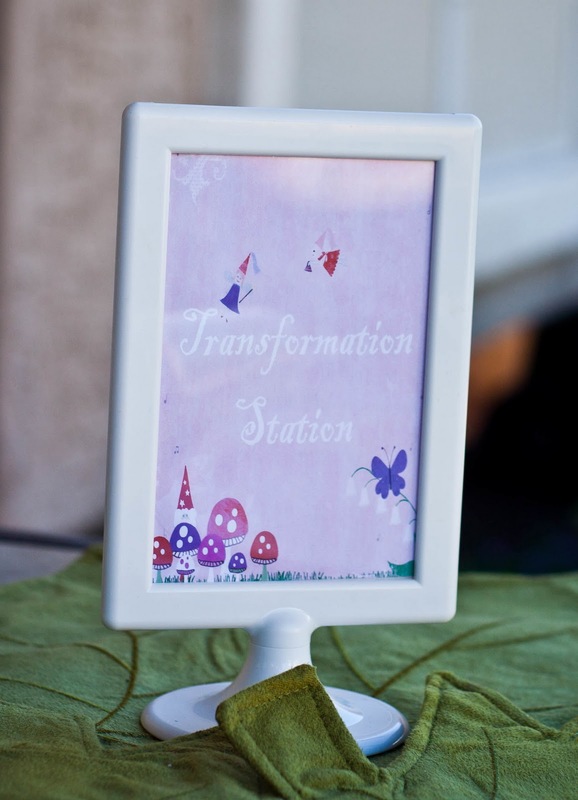 Their adventures began at the “Transformation Station“ where each child (who was willing to wear their costume) was magically transformed into a fairy or a gnome. CHEAP TRICK ALERT: The gnome hats are regular party hats spray-painted a glossy red. 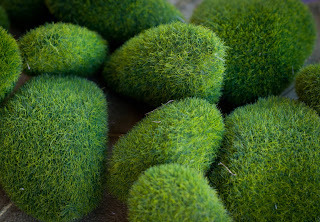 Beards were cut from inexpensive felt and tied on with elastic. 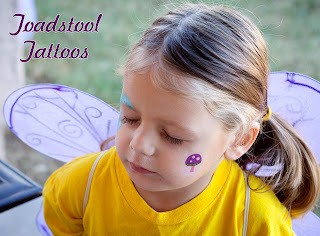 CHEAP TRICK ALERT: I hired my babysitter to come and do the face-painting and tattoos. 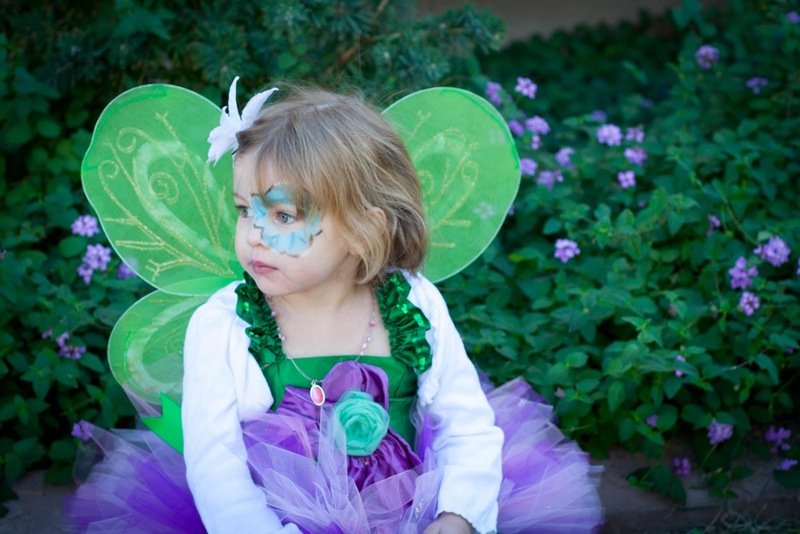 She also helped the kids with their costumes. (And lots of other random things I needed her to do). She’s only 13, so I didn’t have to pay her much. I don’t know what I would have done with out her! 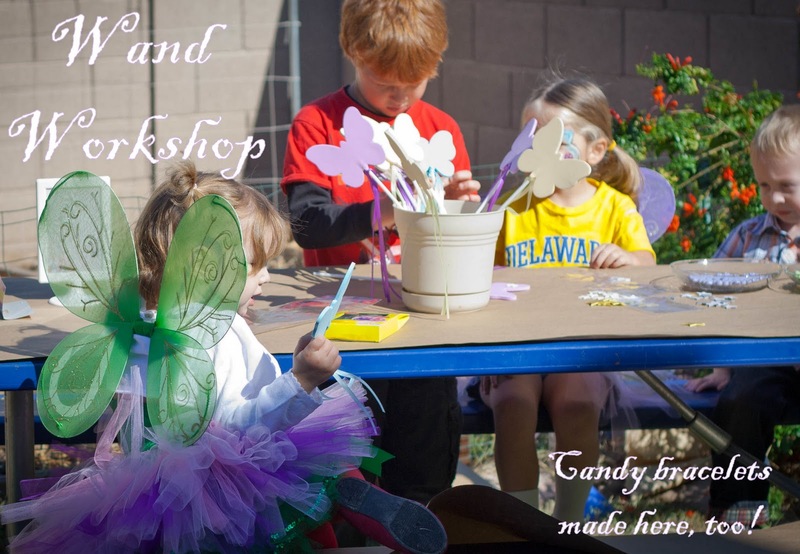 When they were sufficiently transformed, the mythical forest creatures made their way to the Wand Workshop where they decorated their own fairy wands and made bracelets out of magical sweet beads. CHEAP TRICKS: Candy bracelet kit was a Halloween clearance item. I just left out the orange beads, and the Halloween charms. 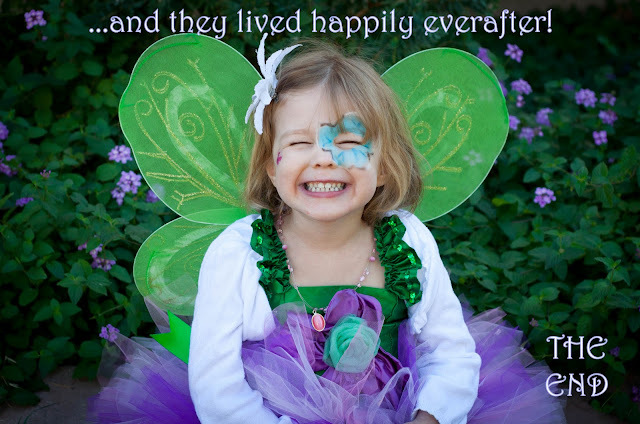 The purple and green beads worked great for the party. The wands were something like 3 for $1 at Dollar Tree and we bought jewel and sparkly foam stickers so the kids could decorate them. 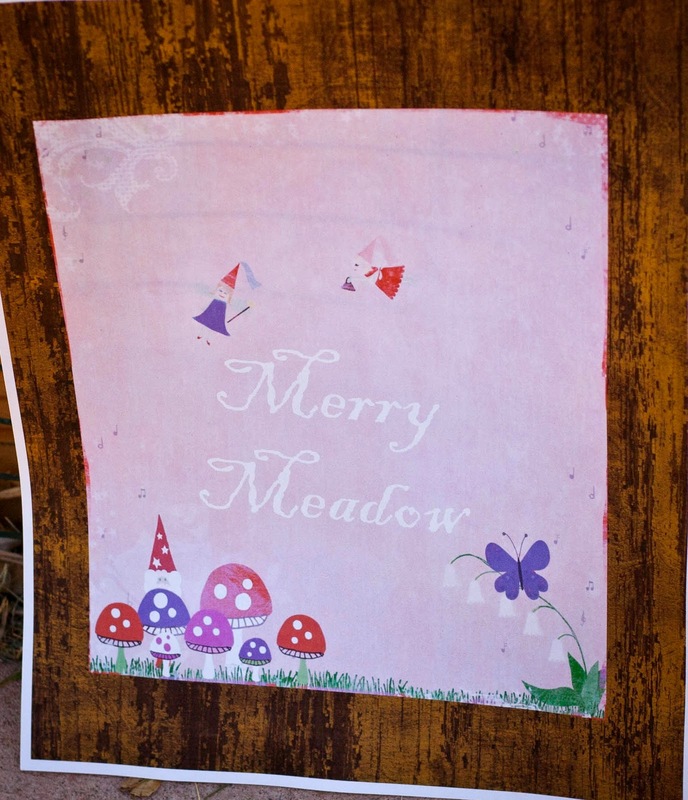 Then they frolicked in the Merry Meadow while awaiting the fairy feast. They love to frolic! 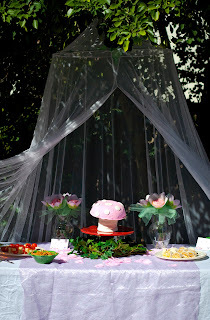 The feast was laid out underneath a gossamer canopy held up by friendly butterflies and dragonflies like this one. CT: Dollar store bugs with googlie eyes removed (this pic is post party and the wings are kind of beat up). Canopy used to be in dd’s bedroom and was hanging around, waiting for an op like this (and the Halloween post) to be used again. 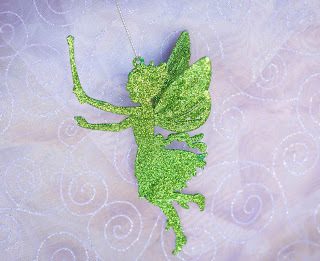 Glittering fairies and fabric were found. TRUE STORY: Some decorations had been purchased, but never made it out in time for the party. Still cute, though! 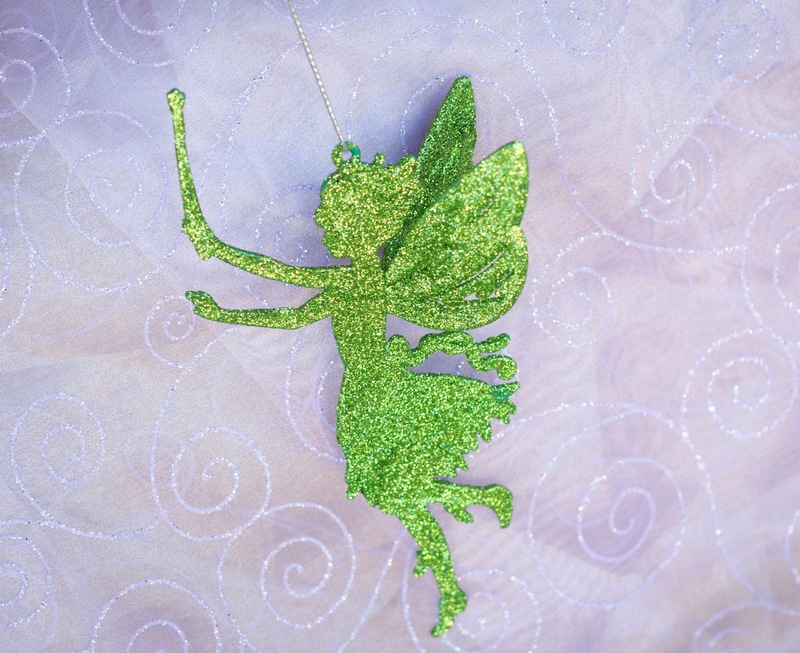 This glittery fairy was actually a Christmas ornament at Walmart. 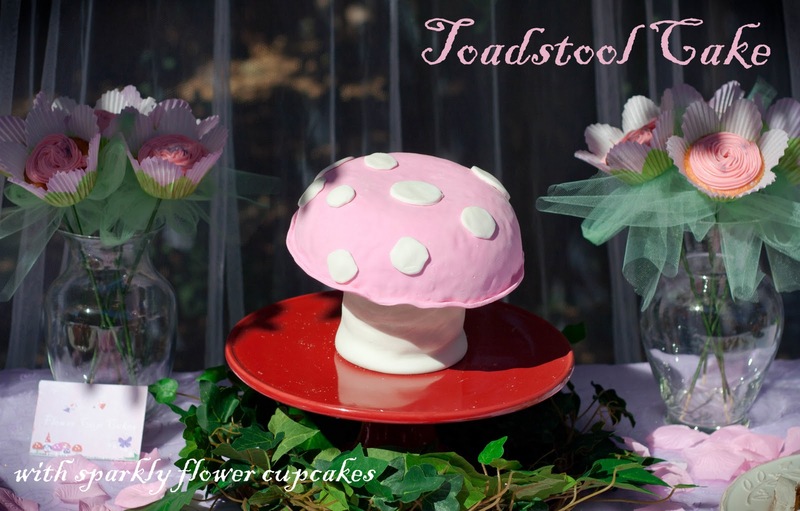 At the center of the feast was Tessa’s pink Toadstool Cake. Flanked by bouquets of sparkly edible flower cup cakes. PARTY SECRETS: The base of the toadstool is cake baked in small round pans. A dowel stuck through it attached the top–rice krispie treats molded into a round Pyrex glass bowl. 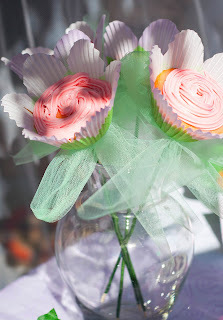 Everything is covered in homemade marshmallow fondant. TRUE STORY: Boy Scout Barry was primarily responsible for decorating this cake. I handed him the recipe for the marshmallow fondant and told him my plan, and he put it together for me. I had already baked the cakes and made the rice krispie top, but ran out of time for the rest. BSB to the rescue! 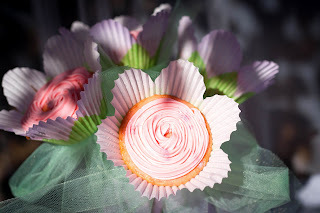 PARTY SECRETS: Flower liners are from Wilton. Photos don’t show it too well, but there is a little purple edible glitter on each flower. “Stems” are bamboo skewers taped with floral tape, and held in place with green tulle bows. TRUE STORY: Cheese sticks with halved cherry tomatoes on top. I didn’t use anything to hold them together, so they didn’t travel well to the table. 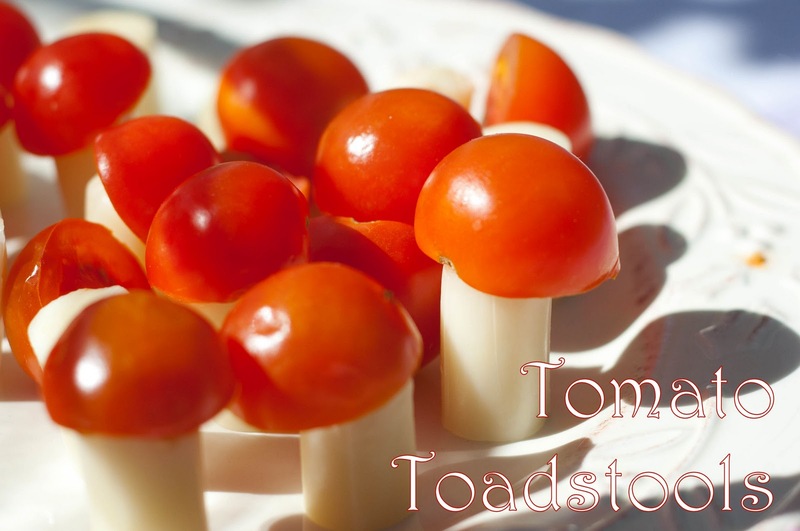 That is why some of the toadstools are toppled. 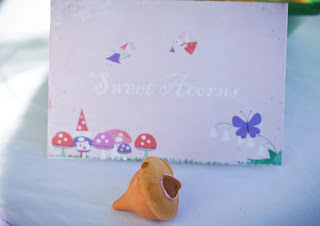 Sweet Acorns, berries, & twigs. Dew Drops and Fairy Berry Punch were served. PARTY SECRET: Acorns are made of pumpkin spice Hershey’s kisses, MINI nilla wafers, and mini cinnamon chips. TRUE STORY: MINI is key with the wafers, BSB HATED the pumpkin spice kisses (said they tasted like soap), and the bowl of acorns melted into a puddle in the sun. Yes it is November, but we live in AZ. 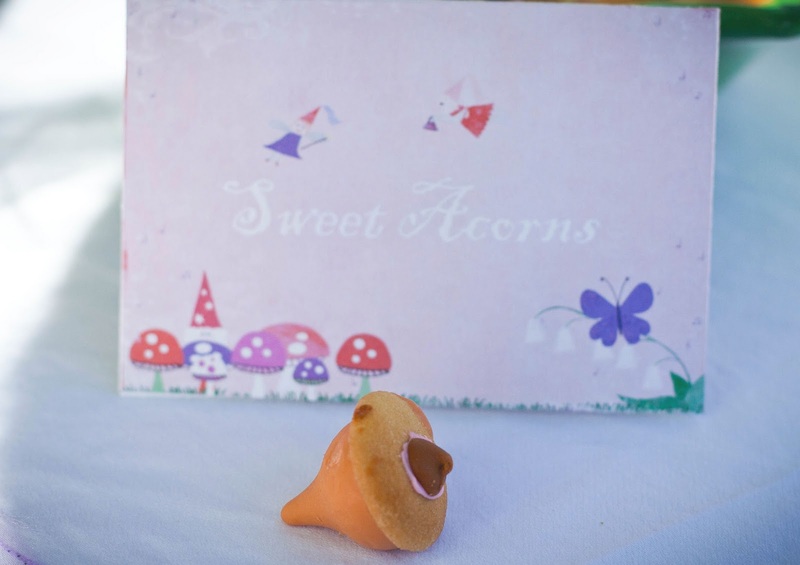 TRUE STORY CONT: Although labels like the acorn one above, had been made for each menu item, most of them were misplaced and didn’t make it out to the table. *sigh* But really, how many of these 3 year old can actually read? 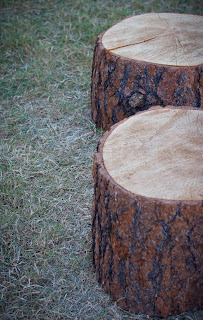 Our forest friends sat on tree stumps and ate off green leaves on a wooden table hewn for the occasion. 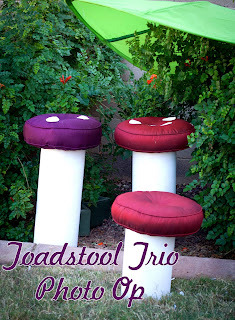 CHEAP TRICK/PARTY SECRETS: We borrowed the stumps from some friends when I spotted them hanging out in their back yard–a much easier and less expensive option than the toadstool seats I was going to make for everyone. They really set the tone for the party! 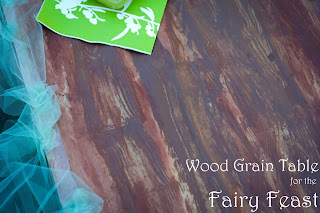 The wooden table was actually a regular plastic folding table, set on a lower bench and covered with craft paper. 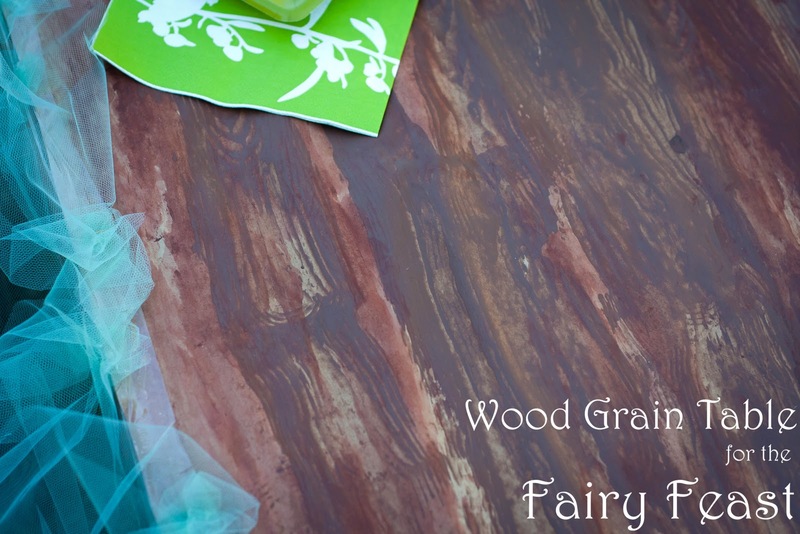 I used brown paint and a wood grain tool to make it look like a rough wood table that might be found in an enchanted forest. 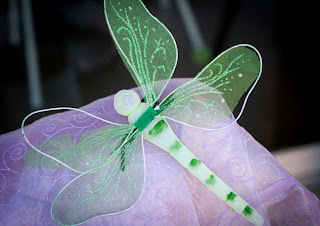 Inexpensive green tulle hot glued around the table covers the plastic and gives a fairy flair. After the feast, it was time for more Fairy Fun! 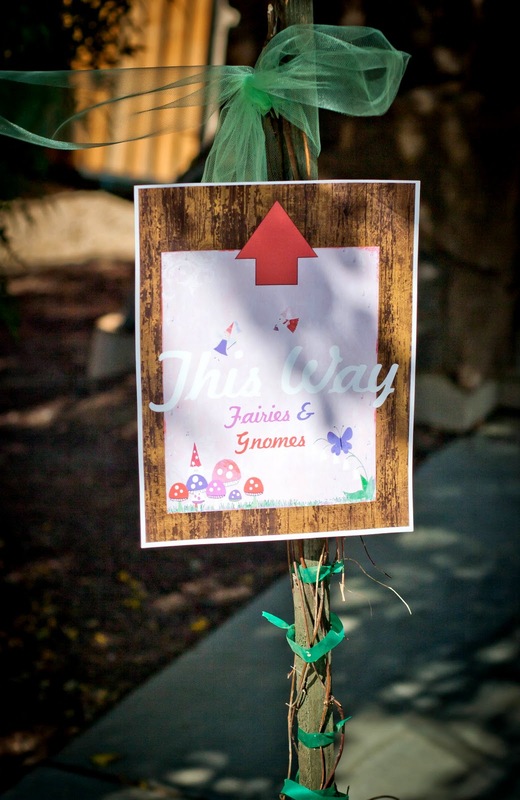 PARTY SECRETS: This was almost an afterthought, but the kids LOVED this treasure hunt. Most of them needed some guidance on eating the pixie sticks, but they were almost more excited about the shiny rocks and bells. 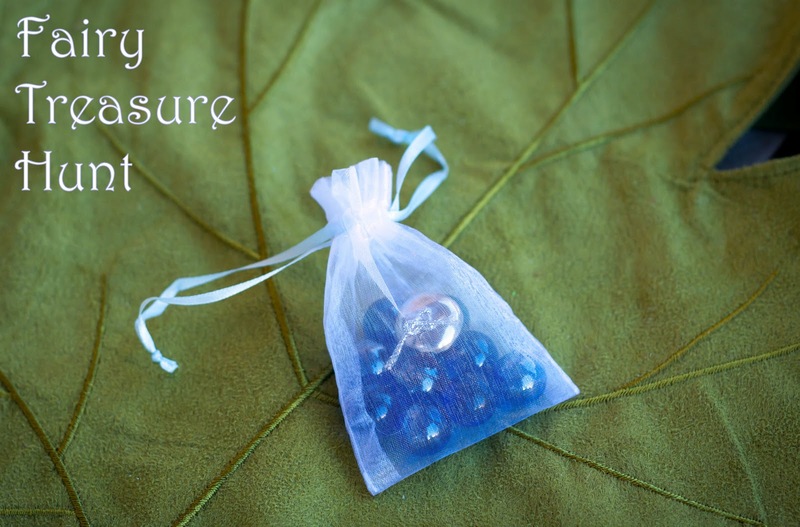 It was pretty much like an Easter egg hunt, but the treasures were smaller and so were their bags. Mostly dollar store finds again. 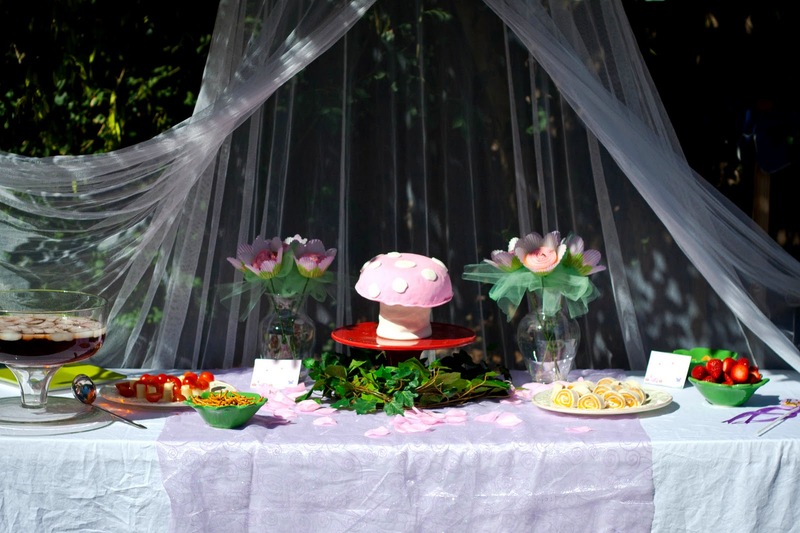 Before leaving, Tessa’s guests stopped to rest in the shade of a large leaf near some colorful toadstools. 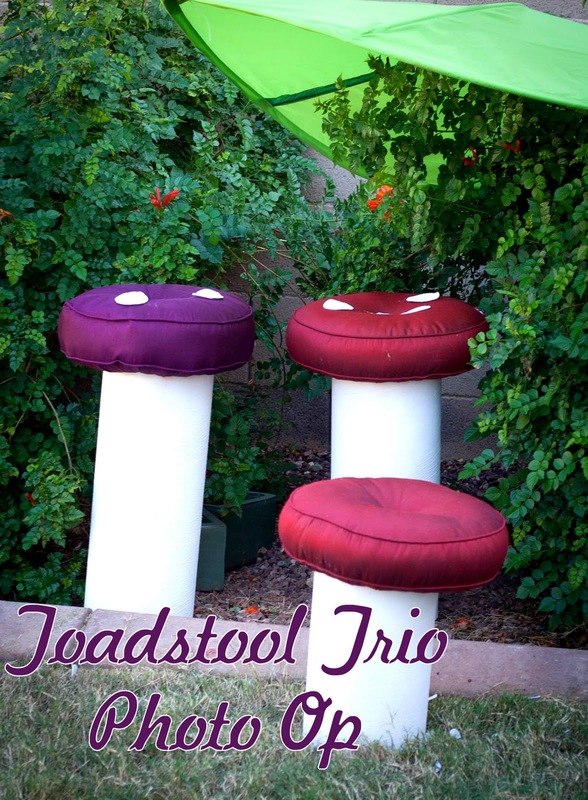 PARTY SECRET: The bases of the toadstools are made from an 8″ concrete form sawed in pieces and spray painted white. 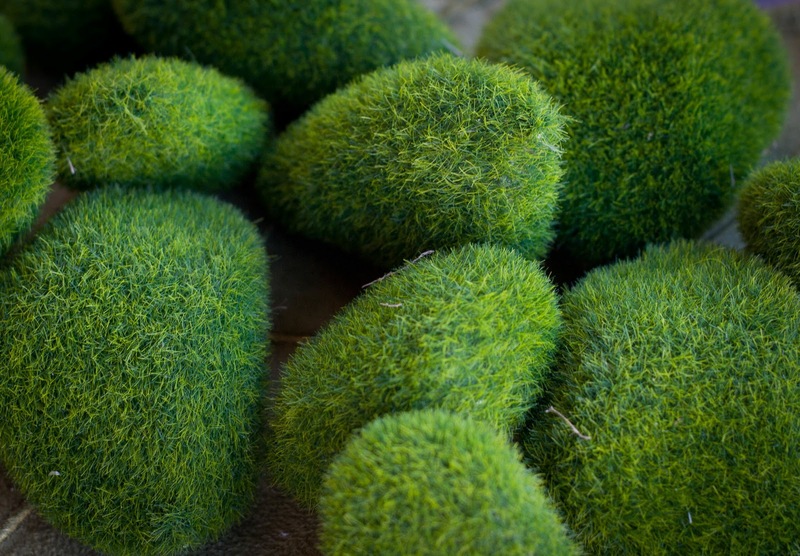 The tops are just round decorative pillows with white felt circles. TRUE STORY: I didn’t want to do anything too permanent with the pillows so I just set the circles on. The toadstools did get knocked down a time or two, spilling their dots, which is why the short one is bare in this photo. My fairy tales and parties are always a little bit fractured, but I think my fairy and her guests had a great time! The boys weren’t as jazzed about the gnome thing as I thought they would be, except for my 6 year old, who went around declaring to all of the boys that he was the king of the gnomes. 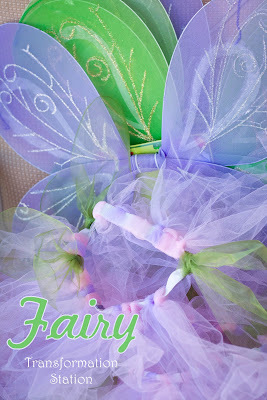 This marks the end of the kid’s parties for the year, so this means that the fairy queen/party planner can take a long winter’s nap until the parties begin again in the Spring. Well, she could if it weren’t for Thanksgiving, Christmas, grown-up birthdays, etc…between now and then. AMAZING party!!! Wow!! Kendra you just blow me away! I know firsthand how much planning, shopping, crafting, baking, making, fluffing, and stressing went into this party! It turned out so beautiful! Well done girlfriend! It is beautiful! Beyond beautiful! It is MAGICAL! Oh and great tip on hiring the babysitter to help! 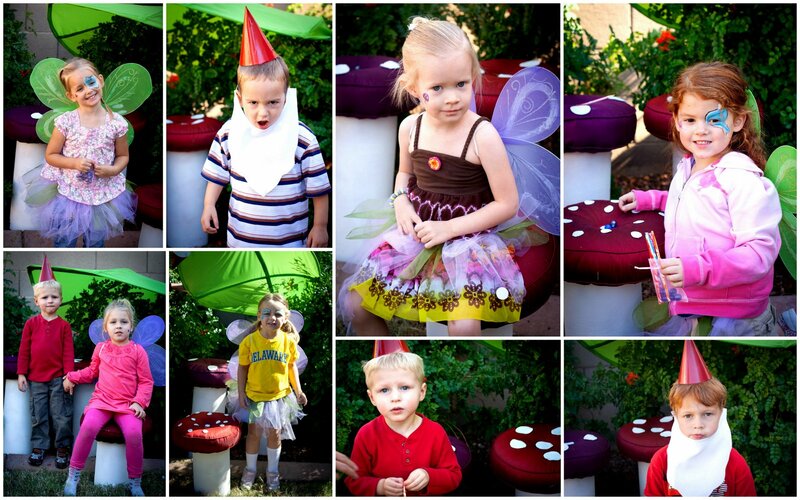 Pretty much the cutest party I have seen in a while! I love it! Looks like they had a blast. Love the cake! 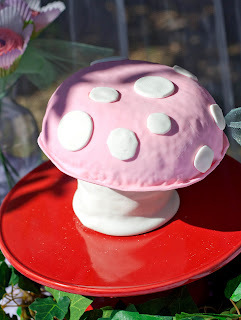 Your cake turned out way better than my toadstool cake! Looks like a fun party. 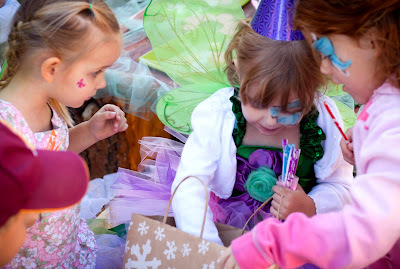 A party any tiny girl would love. Or big girl like me. 🙂 Beautiful–creative and joyful. Kendra…you did a wonderful job! Everything looks great!!! Amazing! What a very, very clever idea for a party! I'm sure this will be a party that the kids will remember for a long time! Love the cake, snails, dress up ideas, table~everything! Super cute! 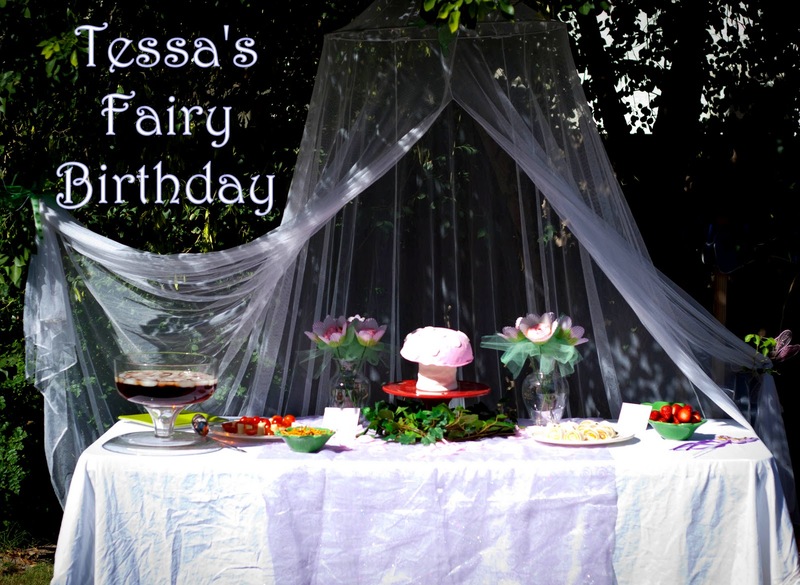 i m really impressed and amazed about the way you turn a party in something so magical!! !.it makes me dream like a little girl!! i couldn t imagine a party like that!!! i m from france and i ve never seen that kind of party!! 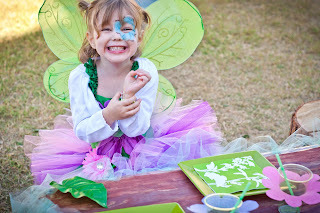 i 'd like soooo much to offer this kind of party to my 2 little daughters! !you 're a great inspiration,but it seems really hard to do!! thanks a lot for sharing your ideas and your tips. Oh lordy, the cuteness is KILLING me! Love it! That party is incredible. I love the tree stump stools and the toadstool cake. The details are fantastic. 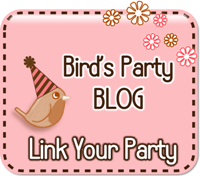 Thanks for hosting the blogiversary party! Incredible! So creative and well thought out. Great job, I feel like this should be a movie. "The Fairy and The Gnome" How Cute! WOW! This is incredible.. i just found your blog and am blown away. Makes me feel lame with my own parties! Thank you so much for all the inspiration. My daughter is having a garden fairy party this summer and I can't wait to use some of your ideas! this is genius! 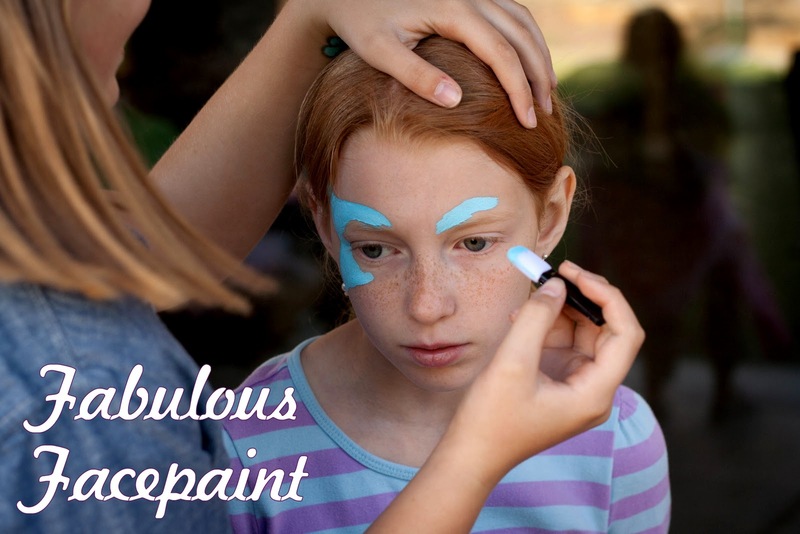 You described it and made it look super easy to do. 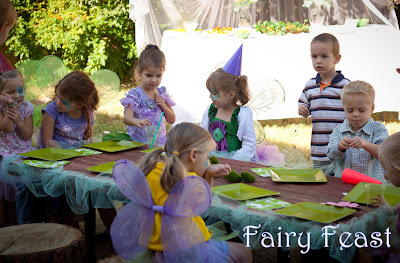 I never have thrown such a great party for my kids! One has a bday coming up, and I was looking for ideas and came to this, and she came up behind me and asked if I was going to throw this party for her. I said that I would do my best, and she hasn't forgotten that statement. lol. wish me luck! 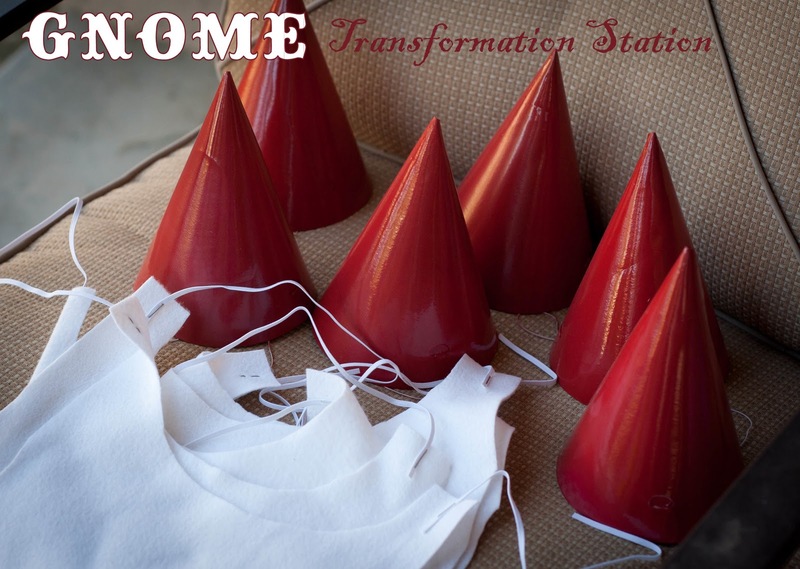 I am sooooo glad I found this via Pinterest…I'm planning for my daughter's fairy party and was going crazy thinking how to incorporate boys…gnomes = genius! Thanks! I love this idea and I am planning one for my 5 year old boy and 7 year old girl joint party. Their birthdays are only a couple days apart. I am so excited! Quick question, what is in your snail sandwiches? Thank you for the great ideas! Love the ideas!!!! what did you make the snail wraps out of? 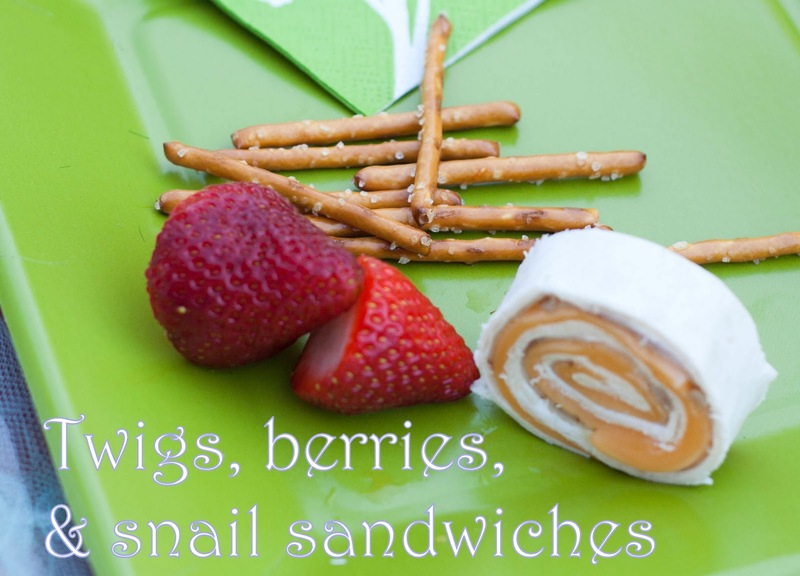 I was just looking back on this post and caught the questions about the snail sandwiches. 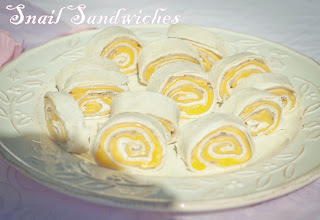 They are really just the pinwheel rolls people make all of the time. I believe that I used tortillas, ham (sandwich meat), and cream cheese. You can use whatever tastes good and will slice well. We thought about adding olive heads with a toothpick on the side, but ran out of time/steam for that. Your ideas are GREAT! 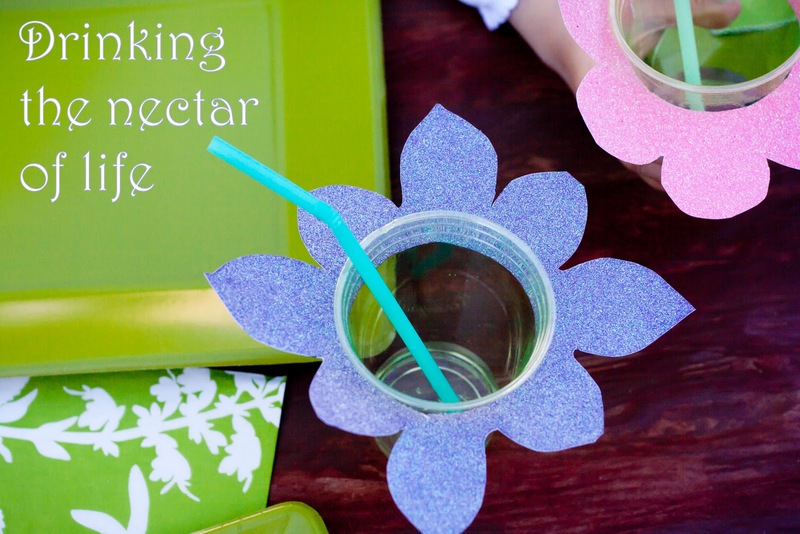 I’m totally borrowing your food ideas for my son’s 1st b-day party. It’s a woodland theme, but very similar — just more animals instead of fairies. 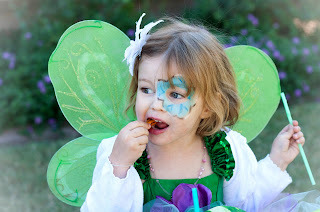 Most parties have beautiful, whimsical foods that I know my kids won’t eat and would be way too hard! twigs and berries! YES! I can do that. 😉 Thanks. I love all of these ideas, just darling! 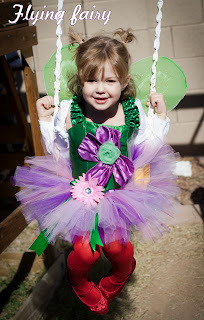 I’m planning a fairy garden party for my almost 3 year old. Do you have a template for the Gnome beards I could use? Thanks so much for sharing!! this blog presents quality based writing. This turned out so darling! I’m using your treasure hunt idea for our winter fairy party coming up soon! 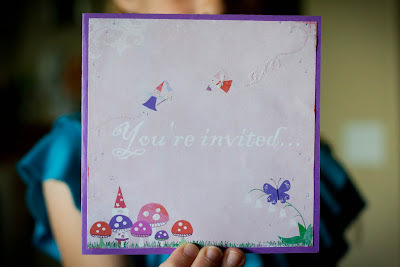 is there any way to get a hold of the invitation that you used? 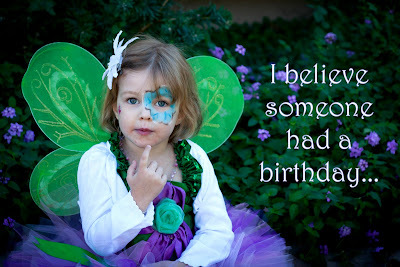 I can’t find it on little dreamer designs. 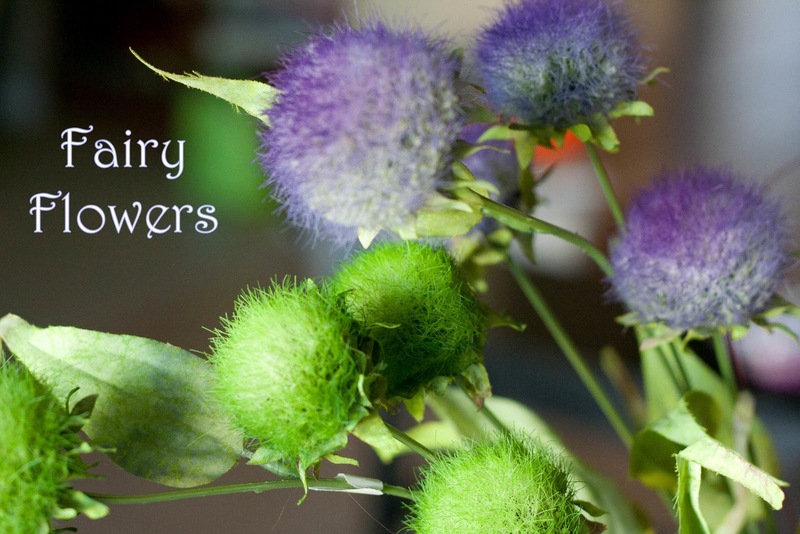 Right here is the perfect blog for anyone who wishes to find out about this topic. You understand so much its almost hard to argue with you (not that I really would want laugh out loud). You certainly put a brand new spin on a topic which has been discussed for years. Great stuff, just wonderful!